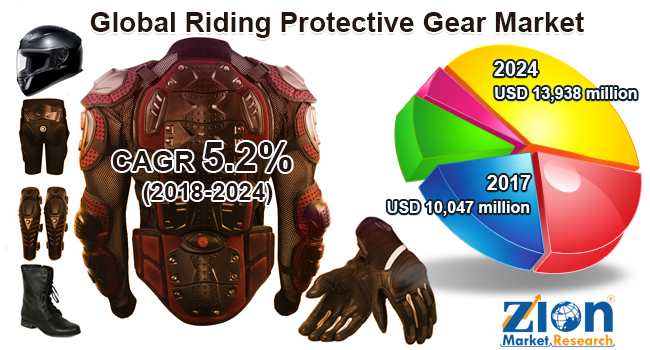 Global riding protective gear market expected to reach approximately USD 13,938 million by 2024, at a CAGR of around 5.2% between 2018 and 2024. The increasing popularity of bike riding and high awareness regarding personal safety are anticipated to be the major factors fueling the riding protective gear market globally in the future. The report covers a forecast and an analysis of the riding protective gear market on a global and regional level. The study provides historical data for 2015, 2016, and 2017 along with a forecast from 2018 to 2024 based on revenue (USD Million) and volume (Million Units). The study includes drivers and restraints for the riding protective gear market along with the impact they have on the demand over the forecast period. Additionally, the report includes the study of opportunities and threats to riding protective gear market on a global level. To understand the competitive landscape in the market, an analysis of Porter’s Five Forces model for the riding protective gear market has also been included. The study encompasses a market attractiveness analysis, wherein all the segments are benchmarked based on their market size, growth rate, and general attractiveness. The study provides a decisive view of the riding protective gear market by segmenting the market based on type, application, distribution channel, and regions. All the segments have been analyzed based on present and future trends and the market is estimated from 2018 to 2024. By type, the global riding protective gear market is segmented into helmets, jackets, knee pads, gloves, shoes, and others. By application, the riding protective gear market is segmented into motorcycle, scooter, step-through, and others. By distribution channel, the riding protective gear market includes specialty stores, mass merchandisers, and online retail. Some key players of the global riding protective gear market are PT Tarakusuma Indah, Jiujiang Jiadeshi, NZI, LAZER, Pengcheng Helmets, Safety Helmets MFG, Alpine Star, Zhejiang Jixiang, Hehui Group, and Yema, among others.